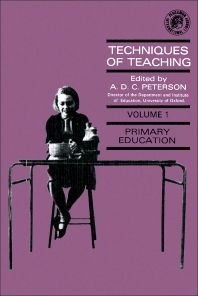 Techniques of Teaching, Volume One: Primary Education presents a detailed account of what happens in areas of education outside the range of personal experiences of teachers. This book aims to help the student in training to understand the training method in a wide variety of subjects. Comprised of four chapters, this volume starts with an overview of the various aspects of children's growth. This book then describes the factors in the development of the social well-being of children or infants of school age. Other chapters examine the concentration upon mathematical principles and integration of arithmetic into the mathematical curriculum, which has resulted in a significant reduction in the amount of time spent on complicated computations and drill work. This book discusses as well the importance of problem-solving method in the teaching situation. The final chapter deals with the objective of teaching art and craft in the child's development. This book is a valuable resource for teachers.